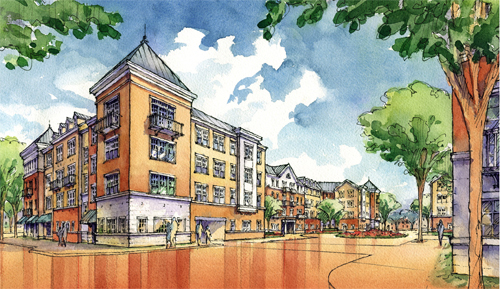 The Park Square mixed-use development, one of the first large-scale private redevelopment projects in downtown Rahway, transforms a 2.4-acre downtown block formerly used partially for surface parking into two buildings with 159 apartments, 6,400 square feet of retail space, more than 200 garage spaces and a park. The development continues the trend of redevelopment that has revitalized the city’s downtown over the past 15 years, especially around its train station. Redevelopment is taking place throughout downtown Rahway as existing buildings are renovated and new buildings are constructed. Park Square, which features housing above retail and parking, uses good urban design to blend its high density of uses into the established context of Rahway’s downtown. The four- to five-story facades are articulated with smaller building elements and reflect the city’s history and character; for instance, the use of brick as the primary cladding material and of towers as distinctive design features evoke many of the older buildings in the downtown. Park Square also maintains a pedestrian character. The two buildings shape a new park with benches, street trees and planting beds, and create a new street that makes the block more permeable for pedestrian circulation. Ground-floor retail on several street fronts and the building’s many doors and windows help open it up to the community. In addition, the structured parking is hidden from view while car access points are minimized. Park Square is strategically located two blocks from the NJ TRANSIT train station, on two principal downtown streets and within walking distance of restaurants, stores, churches, banks, offices, schools, recreation facilities, Rahway River Park, the YMCA, the Post Office and City Hall. Park Square is also well positioned in the heart of Rahway’s Arts District, which was created as an integral part of the city’s Redevelopment Plan to foster a working arts community for the performing, visual and cultural arts and arts-related businesses. The Union County Performing Arts Center, built in 1928 and recently expanded and restored, is less than two blocks away. Most of the recent housing development in downtown Rahway has been for-sale. To diversify the residential market, Park Square offers one- and two-bedroom market-rate apartments for rent. The complexity of land assembly–the site consisted of 13 separate tax lots, mostly in different ownership–as well as necessary brownfield cleanup, required a six-year process of design, acquisition and approvals. The two buildings will be occupied in August 2008 and July 2009, respectively. The increase in the resident population in the downtown as a result of developments like Park Square will help promote several of the city’s goals, including increased customers for downtown stores, services and restaurants.